Stephen C. Smith is an experienced fisheries, maritime and natural resources trial lawyer who has tried admiralty cases in the current and former U.S. Territories in the Pacific, Hawaii and throughout the United States. 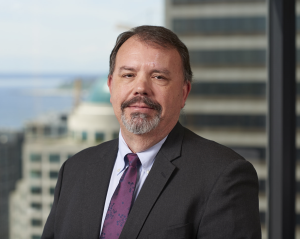 Smith practiced 13 years with and was chairman of the Admiralty and Aviation group of a large Seattle law firm prior to joining Alaska’s largest maritime firm, based in its Seattle office. Subsequently, he moved his maritime practice to the Pacific, joining Oceania’s largest law firm in Honolulu in 2003. Immediately upon arrival, he was seconded to that firm’s Guam office where he tried to verdict one of the largest maritime environmental disasters in Federated States of Micronesia history. As a junior lawyer, Smith served as law clerk to Chief United States District Judge Walter T. McGovern of the United States District Court in Seattle. He has represented numerous governments, stakeholders, ship owners and marine and general underwriters in a wide variety of maritime and regulatory cases. He has presented on admiralty and maritime law at programs sponsored by various marine underwriting organizations, including Underwriters at Lloyds. In 2006, Mr. Smith was lead trial counsel in one of the largest cases ever tried in the Federated States of Micronesia, and was tasked with defending a Japanese shipping company and its London-based insurance underwriters from environmental pollution and natural resources claims ranging from $10 million to $43 million. The local plaintiffs on the island of Yap recovered only a small amount of the sums demanded. Smith’s other substantial trial experience and expertise includes cases involving personal injury defense of claims made by seamen and other maritime workers, natural resources disasters and ship fire litigation. His trial and courtroom experience in tribunals in Washington, Alaska, Hawaii, Idaho and the territories of American Samoa and Guam and the Federated States of Micronesia include fisheries, maritime, professional, products liability, and general commercial cases. Smith also has argued numerous state and federal appeals. He appears frequently before federal and state agencies in regulatory matters, including NOAA, the National Marine Fisheries Service and the Federal Aviation Administration.